The removable appliance is carefully designed to move or to hold your teeth. It is important that it is worn according to instructions and brought to each appointment. For a brief overview of oral hygiene tips, please click on the image below. 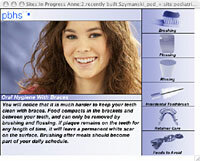 It will launch our educational module in a separate window that may answer some of your questions about oral hygiene. Wear your appliance at all times, even while you are asleep. It may be removed while eating, swimming, or playing vigorous sports activities. In two or three days your speech will return to normal with the appliance in place. Avoid flipping your appliance with your tongue. This can cause damage to your teeth or breakage of your appliance. Your new appliance may make your teeth sore for a day or two, especially after an adjustment. If you have a sore spot on your gums call our office at Kmentt Orthodontics Phone Number 440-205-7500 so that we can adjust the appliance. Clean your appliance by brushing it daily with toothpaste. Denture cleaner can also be used for a more thorough cleaning. If you are wearing a bonded wire retainer behind your front teeth, be extra careful to clean the wire and the area around it. Flossing should be done every day. Never wrap your appliance in a paper napkin or tissue and set it down on the table. You or someone else may throw it away. Don’t put it in your pocket when playing or you may break or lose it. Whenever it is not in your mouth it should be in its plastic appliance case. Remember what we tell you: IN YOUR FACE OR IN YOUR CASE! Keep your appliance away from dogs or cats as they love to chew on them. Avoid storing them near any source of heat. Do not boil your retainer to sterilize it! If needed, bring it to the office and we will be happy to disinfect it for you. An additional charge will be incurred for lost or broken appliances.